Golden Princess explores the old theme of the treasure left behind by some ancient civilization. In this case, the rich civilization that the game refers to is that of the Mayans. You will find in the game a rich design, using gold with lots of decorations in the construction of the buildings and Mayan temples, with treasure chests that are overflowing and with various Mayan people and wild predators that the South American jungles have. Despite the heavy use of gold in its design, it manages to be a decent looking game. 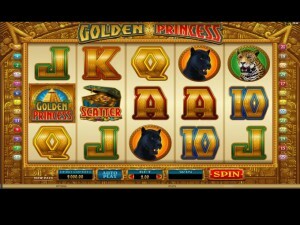 The gold themed slot has 5 reels with 25 bet lines. 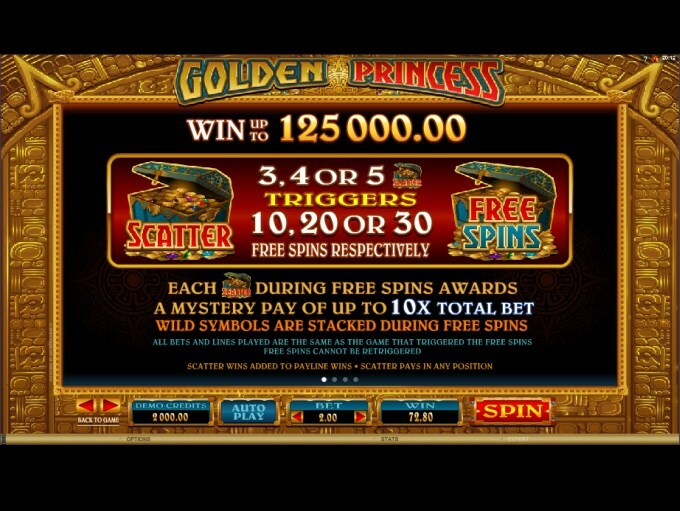 It also offers a decent round of free spins, scatter symbols and a wild with multipliers. Despite all that gold that is used in the design, the prizes only go up to $15,000. 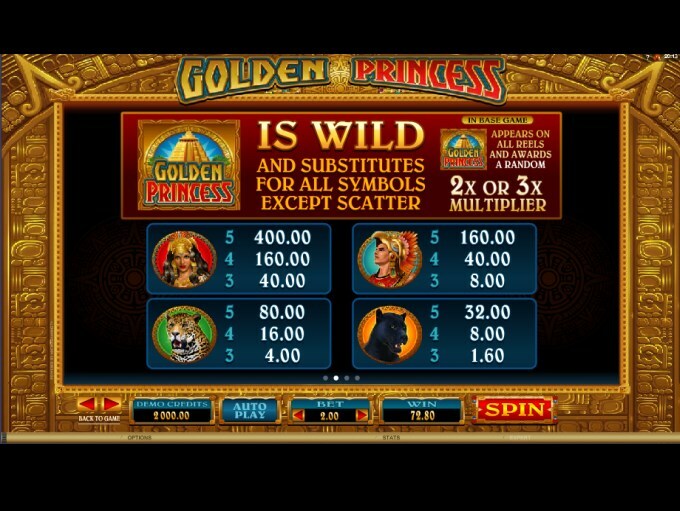 The features are the basic ones, wild and scatter, but they can bring you some nice additional free spins and multipliers, so they’re not going to get boring as quickly as others would. 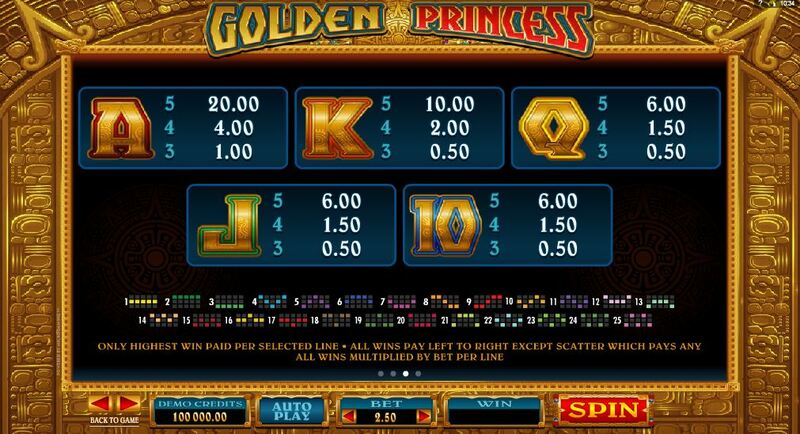 The Mayan temple, with the Golden Princess logo in front, is the symbol that acts as the wild feature of the slot. It’s only going to be a wild, without offering its own prizes, but at least it adds a multiplier of 2x or 3x to the combinations created with its help. The only symbol that can’t use the wild to its advantage is the scatter symbol, but that’s to be expected. The other symbol, the scatter, is represented in the game by the image of an overflowing treasure chest. As a scatter symbol, you need 3 to 5 of them to get the free spins that they can trigger. You don’t get cash prizes from the scatters though, which is usually something that you can rely on in other slot machines. It’s something to keep in mind, a downside of the game, the fact that neither feature symbol awards prizes directly. The free spins offered are at 10, 20 or 30 rounds, for 3, 4 or 5 Treasure Chests, respectively. 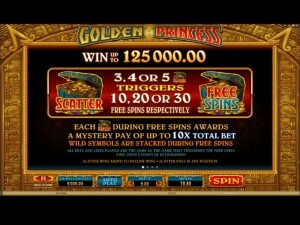 For each scatter that appears during the free spins, you get a mystery prize, of up to 10x the bet. 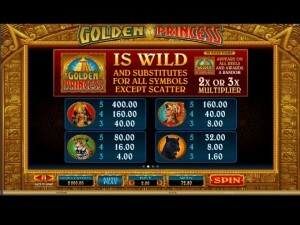 One other advantage of the free spins is that they offer you stacked wilds for the duration of the feature. 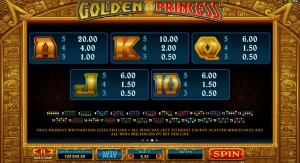 Every line you activate can get a bet of up to $1, the minimum being only $0.01. The game makes use of up to 10 coins to get to that $1 maximum level, their denomination reaching $0.10. With 25 lines used, the maximum bet is $25. As for the prizes offered inside, you can get back 15,000x what you wagered on a single line, so up to $15,000 (150,000 coins). That’s a decently sized payout, and about the maximum that you can get back from a slot (most are at 10,000x or bellow). The use of so much gold in the design of a game usually signals trouble, as developers rarely manage to make it look good when it’s so reliant on a single color. They do a good job with it here though, using the gold material for the walls of the temple, so they’re all heavily decorated with Mayan pictures and symbols. The rest of the images, the ones from the symbols, are of very good quality. Symbols: Mayan Pyramid (wild), Treasure Chest (scatter), Princess (5,000x), Mayan Warrior (2,000x), Leopard (1,000x), Panther (400x), Ace (200x), King (100x), Queen (60x), Jack (60x) and Ten (60x). There are quite a few slots built around ancient civilizations, and many of them look great, but this one should be considered as well. Its payouts are very good, when you consider the amount you use to get them. 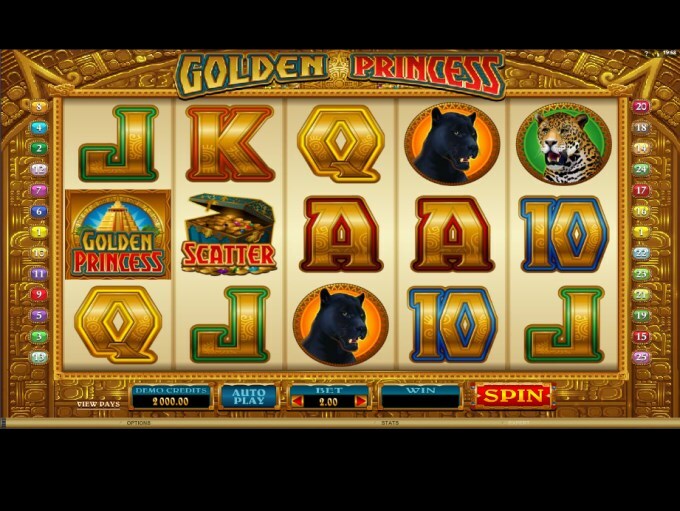 You will find Golden Princess at any online casino which chooses to use software from Microgaming, playable either for free or for real money.